At Michael Richards Hairdressing we know just how important fabulous hair is on your holidays. That’s why we have teamed up with TravelQuest to bring you an exclusive Hair & Holiday Evening. 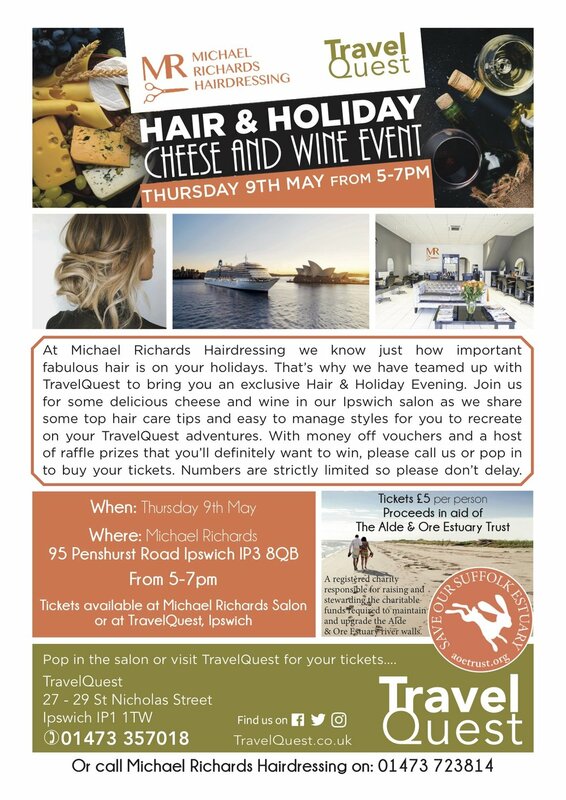 Join us for some delicious cheese and wine in our Ipswich salon as we share some top hair care tips and easy to manage styles for you to recreate on your TravelQuest adventures. With money off vouchers and a host of raffle prizes that you’ll definitely want to win, please call us on 01473 723814 or pop in to buy your tickets. Numbers are strictly limited so please don’t delay. Tickets are £5 with all proceeds going to Suffolk based charity The Alde & Ore Estuary Trust.